I am relying on a New York Times live blog timestamp[i] from the signing ceremony to determine Obamacare’s inaugural time. At 11:51 AM it was posted that the signing had begun. Two minutes and twenty-two pens later, President Obama finished signing his name. Since muhurta inauguration is defined by the time you "start" a ceremony or activity, I've chosen to subtract one minute from the blog posting time. The Obamacare muhurta was inaugurated at 11:50 AM on Tuesday, March 23, 2010 in Washington, DC. First we examine how President Obama’s natal chart is linked to the muhurta chart. We do this by evaluating 5 balams (strengths) of astrological relationships between the two chart's Moons, Ascendants and the stars they occupy. A balam can range anywhere from unsupportive to highly supportive in nature. In this case, two of the balams are totally unsupportive, one is fully supportive, while the other two are mildly supportive (at best). (See Exhibit 2 for details). This is by no means the strongest overall balam relationship, but it can still facilitate moderate success. If the President had signed the law into existence either one day earlier or one day later, a far more supportive sky would have been at his disposal. Muhurta interpretation includes evaluation of various types of panchangam astrological data. Positive and negative yoga combinations are defined from this data which are shaped by solar and lunar positions. These combinations include nakshatras (stars), tithis (lunar days), karanas (lunar half days) and varas (solar days). Obamacare was signed during the highly obstructive Vishti Karana. It is present when the Moon is in the 1st karana of the 8th tithi. Even non-astrologers in India commonly understand never to start a new venture when Vishti is present. This obstruction is counter balanced by the auspicious Jaya Siddha yoga which is formed when the Moon is in its 8th tithi on a Tuesday. These contrasting yoga relationships reinforce the pattern that in some ways there will simultaneously be strong support for success and significant obstacles to overcome. With the relationship between the President's natal chart and the signing muhurta chart understood, we are ready to analyze the strength of the muhurta chart itself. Once again, we'll focus on the strength of the 1st house and 1st lord followed by the yoga and dasha activation in time. The stars will provide a rich contextual backdrop. As a clarifying note, a muhurta is an event (not a human), so there is no true "native." Nonetheless, the descriptions and inherent nature surrounding the event can be assessed. For lack of a better word, I'll at times use the term "native" to represent this. The twin sign Gemini was rising during the signing ceremony. Its lord Mercury was occupying the 10th house (fame, success and career) in the twin sign of Pisces. It is not surprising that this new program would have two names; its given name, "The Affordable Care Act" and its adopted name, "Obamacare". There are also two alternate world views of its effects. Supporters see Obamacare as a major moral, social and economic breakthrough. Detractors loudly exclaim it is the downfall of United States society and economy. At first glance, the muhurta chart will leave many astrologers gasping with concern. Mercury, the lord of the chart is debilitated (FTW) (see Exhibit 3 for Planetary Strengths definitions) in the 10th house, aspected by NM Saturn forming a Second Tier Weakness (STW). The cold raw energy of Saturn’s gaze is heightened by the fact that Saturn is retrograde (FTS), increasing its destabilizing effects. The 1st house is taking a beating. It is occupied by NM Ketu (South Node, aka the tail of the serpent) and aspected by NM Saturn. Ketu's presence assures a lifetime of surprises, accidents and difficulties. It forewarns that the program is a real oddball, bound to fall into sticky situations. NM Saturn's aspect on Ketu (STW) exacerbates the situation even further. NB Moon’s 1st house occupancy (STS) and NB Jupiter’s aspect (STS) provides minor saving grace. In summary, the 1st house and lord are poorly conditioned and unstable. The program will spend its first eleven years under the dasha rulership of Rahu (North Node, aka the serpents head). Rahu will add to Obamacare's unpredictability, poisoning many of those associated with it. There will undoubtedly be constant struggles during the Rahu ruled years. A closer look provides a different perspective. Debilitated 1st lord Mercury has Neecha Bhanga raj yoga strength. Mercury is also directly involved in several other yogas, lifting Obamacare to a level above the average legislation. Mercury as 1st lord (healers, Obamacare itself) and 4th lord (mother) associates with FTS exalted Venus, 5th lord (children, counsel) creating two separate Dharma-Kharma Adhipati raja yogas[ii]. It will provide wise healthcare counseling for mothers and children. Mercury joins Jupiter and exalted Venus to form a Saraswati yoga[iii] (famous, learned orator). He also combines with the Sun (FTS from directional strength in the high noon 10th house) to form the common Buddhaditya yoga (intelligence). By themselves, these yogas point out some intelligence can be found in the program. 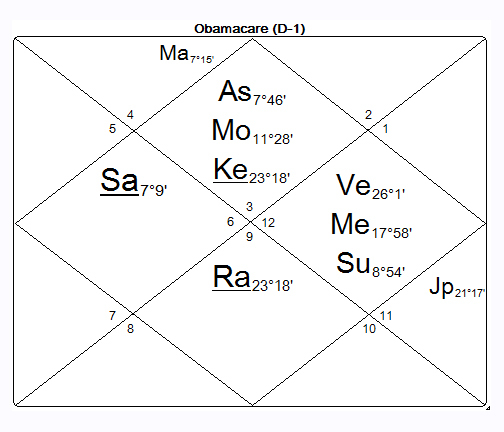 Since Mercury is the 1st lord deeply involved with other FTS planets creating these yogas, one should upgrade their interpretation to indicate Obamacare is extremely well designed, maybe even brilliant. The malefic stare from 9th lord Saturn on Mercury is not completely negative. 1st and 4th lord Mercury reciprocates with a full aspect on Saturn creating two Dharma-Karma Adhipati yogas. This reinforces its counseling abilities and good fortune (9th house) regarding illness (Saturn), especially for mothers (4th house). 11th lord Mars which is presiding over social acceptance is debilitated (FTW) in the 2nd house of family and saved wealth. Continuing an existing pattern on this topic, Mars has Neecha Bhanga yoga strength. This signifies that Mars periods will conjure short term disruptions regarding social acceptance and money. Ultimately, through sustained effort, these disturbances will pass, resulting in an experience of redemption. Venus and Sun yoga relations with 1st lord Mercury will produce success and fame for Obamacare during the periods that they rule. This is especially true for exalted Venus (FTS) in the angular 10th house which forms a Pancha Mahapurusha yoga[iv]. While there are no dashas invoking these friendly characters for the next 40+ years, there are multiple bhukti periods that will petition their benevolence in the mean time. The Ascendant and the Moon are both in the star Ardra , highly accentuating its effects on Obamacare. Ardra is symbolically represented by a teardrop. It is a star of great intensity with constant head butting, anger and rage. Its deity is Rudra, a storm god who controls destruction and dissolution. Rudra is ultimately the remover of misery by eliminating that which is no longer useful. Ardra natives have a deeply ingrained preference for independence, ardently facing challenges to their sense of freedom. They have a strong drive for self-improvement. Natives experience a deep satisfaction for sticking it out through the hard times with an understanding and appreciation of how difficult it was to accomplish their goals. Common professional themes for Ardra are butchers, surgeons, makers of toxic chemicals that kill viruses and bacteria, chemotherapists, pharmacists, meddlesome politicians, liars and thieves. Obamacare attracts such people and professions like moths to a porch light. It has been the venue of a political dogfight of epoch proportions. Who can forget South Carolina Representative Joe Wilson’s unprecedented callout, “You lie!” when the President was addressing health care legislation in the 2010 State of the Union Address? In November of 2013, President Obama was forced to admit that his promise of all Americans being able to keep their old insurance was not technically true. The opposition has loudly claimed vindication to their allegations that the promises of Obamacare were fraught with lies. Proponents assert the opposition has spread horrendous lies about death panels, overall costs and a government takeover of health care. At the time of writing this article, Obamacare has demonstrated Ardra’s perseverance by continuing to overcome obstacles to its startup. It has endured a government shutdown, a disastrous web site rollout and the refusal of Republican governors to fully execute the program in their states. It survived a Supreme Court ruling in favor of its constitutional right to install a mandate. An unforeseen last second sign-up rush resulted in 8 million registrations by the March 31, 2014 deadline. This far surpassed the Administration's target number of 7 million enrollees, the stated requirement for financial viability. 1st lord Mercury resides in the star Revati. Projects of Revati natives are often pushed forward by leaps and bounds with much fanfare and noise. They are good hosts and dependable friends. They care for handicapped children and/or parents and are drawn to charity and volunteering. What has received more fanfare in recent years than Obamacare (both for and against)? Does not its major objectives include the provision of care for children and those with “pre-existing conditions”, whether or not they can afford it? Purva Ashadha is often associated with secrets and has an alternate name that means “the Undefeated.” The strong minds of Purva Ashadha natives will not allow them to suffer defeat in struggles and confrontations. They are determined to expand in a sustainable way and are focused on unending improvement. They are patient, frank and don't complain. They just keep plodding away to achieve their goal. Has any topic inflamed more heat and anger over the past few years than Obamacare? The total girth of the 906 page legislation leaves it vulnerable to claims that secret death panels and liberty restrictions are hidden within. Its success is heavily reliant on expanding through open enrollment. Both political Parties agree that problems exist in the law. For Obamacare to survive, improvements and adjustments will be inevitable in the coming years. Rahu is known as the great impersonator. He blends into a crowd like a chameleon. He takes on the appearance of any planet he associates with, is aspected by, or by the owner of the sign he occupies. Less known is that he very strongly takes on the nature of the planet who rules the star he occupies. Rahu resides in the star of Purva Ashadha which is ruled by Venus. Rahu will act like and produce the results promised by Venus. As stated earlier, Venus is exalted in the 10th house (fame, success, and career) and is involved in multiple yogas. Rahu must show career success and fame during his reign. One can expect such success to be magnified during the Venus bhukti which will take place between March, 2015 and March, 2018. Rahu is tenanted in the 7th house while Ketu is 180 degrees opposite in the 1st house. Rahu and Ketu share a unique relationship since they are in reality, two sides of the same entity. In this relationship, Rahu is the source of an awakening and change in life patterns while Ketu is the engrained area of life being affected. In this instance, the 7th house (partners, general masses) is causing change to the 1st house (the body, Obamacare itself). One might interpret this as the general public and or Congress forcing changes to the Obamacare law. 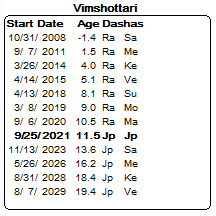 There will be continuous modifications throughout the Rahu dasha paticularly during the Ketu sub-period from March 2014 through April 2015. 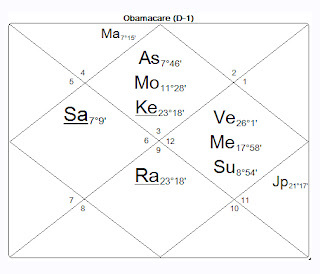 President Obama’s natal chart has signaled more cooperation from Congress and state governments during this period, so it is reasonable to expect changes he actually desires. One obvious change is that more states will be accepting federal aid to expand Medicaid. Rahu is still going to be offbeat and unpredictable, causing misdiagnoses and disruptions. Unexpected things will continue to go wrong (like the online registration overload). These difficulties cannot be avoided, but ultimately Rahu's tenure will end in success for the program. Obamacare will move into its 16 year Jupiter dasha from 2021 through 2037. Jupiter is well placed in the 9th house of good luck and counseling. As the lord of the 10th house, he will bring good fortune and success for the law. He is aspecting the 1st house, strengthening Obamacare’s own health and well being. He also aspects the 5th house (children and counseling). 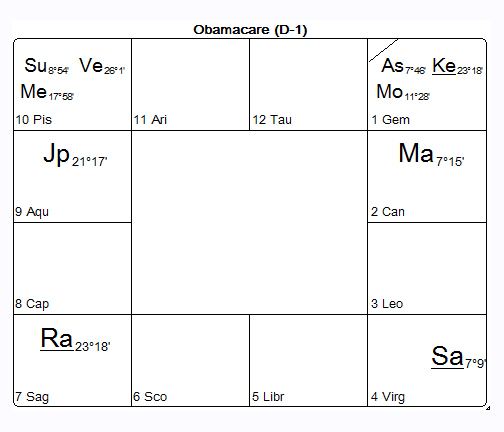 Obamacare will have a smoother, more effective sixteen-year reign during its Jupiter dasha. Summarizing the overall situation, President Obama's natal chart supports that he has the strength and ability to successfully implement a national health care program, notwithstanding some struggle. His chart begged for a good muhurta to limit the collateral damage along the way. Instead a weak muhurta was chosen. Viewing the situation from a retrospective point of view, one can conclude that the unconscious selection of a weak inauguration time reflects the nature of Obama's natal chart. During that period of his life, he was unlikely to select a time that would have made things easier. The failure to select a strong inauguration time for the signing and website (see Part 3: What About That Website Disaster?) illustrates the integral role in governance that court astrologers played in ancient kingdoms. This type of wisdom is now sorely lacking in modern society. Questionable time selections as this would have resulted in serious consequences for an ancient court astrologer. Given the strong political opposition, one could rightfully question how a good muhurta would have improved the Obamacare implementation. An astrologer can never say what would have happened (after the fact), but there were obvious places which could have seen improvement. The response to the ongoing misinformation was incredibly ineffective. The Obama team could have implemented a much more successful marketing plan, challenging the inaccuracies while addressing the positive aspects of the law. Early warnings regarding the website might have found a stronger call to action, prior to its failed implementation. Obamacare has more than its share of inherent warts and weaknesses. There will continue to be “major” trials and detractors of this program for several more years. It is also clear that Obama’s birth chart and the Obamacare muhurta and the web site’s muhurta, all show an inordinately strong will to survive and self-improve. Ultimately, after much struggle, Obamacare should surpass even the most critical standards of success, attaining a high level of public approval. Copyright © 2017 Umapati Collins. Picture Window theme. Powered by Blogger.